O.U.P. sent me an evaluation pack of their course Allez (Book 1) to review. I should point out that they do not pay me to do this, but it is of professional interest to me to look at courses and from Oxford's point of view they may feel that any publicity is good! 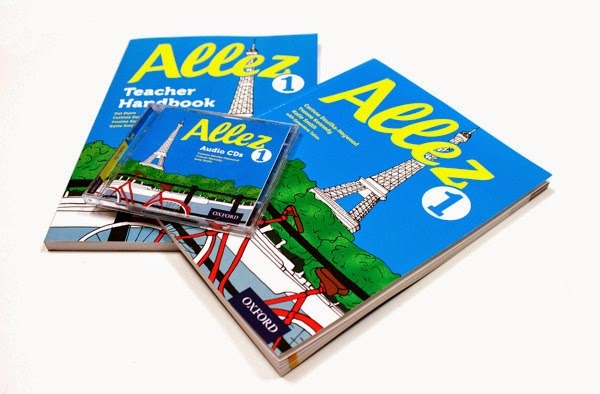 Allez is written by Corinne Dzuilka-Heywood, Yvonne Kennedy and Katie Smith with help from Geneviève Talon. It is designed to be suitable for teaching the new KS3 curriculum, with its greater emphasis on grammar, literary texts and translation. I'm having a look at the pupil book, Teacher Handbook sample, Kerboodle sample and Grammar and Skills Workbook by Michael Spencer and Liz Black. There are many aspects you need to consider when weighing up a new course. I listed my own criteria for assessing courses here. Ideally you would like to be able to see all the books over a key stage to see how content, progress and revision are catered for, but the rushed nature of curriculum reform means that we get to see one book at a time in general. Teachers may be looking at a range of contenders this summer, including this course, Tricolore (for higher ability) and the popular Studio from Pearson. So what does Allez have to offer? Although aimed at the full ability range Book 1 seems to offer a high degree of challenge in terms of grammar and vocabulary presented. The material is less finely graded than in Tricolore, for example, and builds up in complexity quite quickly. Each of the nine units has a topic title, subtitled with the key vocabulary, grammar and skills covered. Unit 1 gets straight into nationality, gender with definite articles (indefinite articles are often encountered first in books), prepositions with countries, je m'appelle and je suis, numbers up to 30, expressing age with avoir, colours and adjective agreement, physical features and objects (including materials and shape). This shows the authors are not overly concerned with fine-tuning the selection and grading of language. I am slightly uncomfortable with this approach, but it may suit some teachers who worry less about such matters. It may also reflect the greater degree of challenge we are supposed to be seeing as well as an assumption about what children may have done at primary school. Whether students cope with it is another matter. Unit 4, Boire et manger, adopts a conventional approach with pictures, short texts, gap-filling with du/de la/des, matching with translation, listening with tick boxes and true/false, short paragraph writing, menus to read, a dialogue to do, some pair/group work, quite a lot of questions in English (which involves translation), unjumbling of sentences etc. There is undoubtedly a lot of material, most of it usable or adaptable for other activities. Difficulty level seems not far short of Tricolore, but there is significantly more English content. Immediate future tense is introduced at this stage - I would have left it until later, maintaining the focus on embedding present tense. So, in general, exercise types are mainstream. Matching, gap fill, simple listening tasks, use of pictures to stimulate oral work, box-filling, a little translation, true-false with statements in English, sentence writing, situational dialogues to read and perform. Teachers would have to provide their own repetitive drill-style oral exercises, dictation, translation, if this is their preferred approach.There are grammar boxes with simple explanations and "strategies" boxes which help students how to improve their skills. This is a notably prominent and strong aspect of the book - helping pupils how to learn effectively. In addition, there are "plenary" boxes to encourage students to assess how well they have picked up points. One pleasing inclusion is video listening. Each unit has video material with exercises to do in the pupil book. These videos feature in the Kerboodle package too. More about this below. Units also have "labo-langue" pages in green which essentially focus on grammar and writing. These include large "strategies" boxes to help students develop techniques of memorisation and writing. Reading tasks include some of a literary nature, as one would expect with the new curriculum. This really feels like lip-service to me, as I said in the review of the Tricolore book. To me, the poem on page 18, Pour dessiner un bonhomme, for example, is not of great use for practising language and as a teacher I would have ignored it. Each unit comes with a short test of the four skills and a summary vocabulary list which many teachers would find useful for rote learning. I should also mention that the back of the book comes with a customary and useful alphabetical French-English glossary, verb tables and set of grammar explanations. There are no extra extension tasks as in Tricolore, but the Grammar and Skills workbook provides this. This 63 page student booklet offers a good range of grammar activities, clearly laid out, with brief explanations and exercises with a decent number of examples. There is, notably, a greater stress on translation into English. I find this regrettable, but understandable given recent curriculum changes. This is a classic case of the "backwash effect", exams leading pedagogy, and not in a good way. A word about the online Kerboodle package which goes with the course: as with Tricolore from the same stable, there are two purchase options - the more popular one, I would think, will be the interactive assessment and other resources. The second would add on an online course book for every student. This may be worthwhile for schools who do not give out textbooks to keep and take home. Kerboodle is tablet-friendly, customisable, editable and teachers can add their own resources. The online samples are limited, but I did look at some video featuring children talking about a a time capsule (to practise objects, materials etc). This is the same video used at the end of Unit 1 in the pupil book. The language is authentic enough, clear, on the fast and hard side for Y7 and a little "acted out", but the children play their roles well. Teachers may find it useful to extract short snippets for intensive practice and modelling. It must be noted that the annual licence adds a lot of cost for cash-strapped departments. Resourcing an MFL department gets more and more expensive. Could you use this course? Definitely. Some teachers may be wary of the level of difficulty for their classes and look elsewhere, some may feel there is too much clutter on the pages, some may feel there are not enough examples of grammar practice to embed knowledge. Compared with Studio the presentation and content looks staid, but the pedagogical approach looks generally sound. There are plenty of input and output tasks, but I would repeat that caveat about the selection and grading of language. Unit 2, for examples, gets pupils to recognise past tenses. Is that necessary? Could it confuse? Does it all move along a bit fast? Can we challenge more? Or do we risk overloading too many students? I am looking forward to having a good look at this book. The supporting online packages sound great. Could be an effective way to get students to take more ownership of their learning! OUP have since sent me a copy of the second student book. My first impression was that content was on the dull side, but this was only an initial impression. It's always worth comparing all available courses. Studio may be a more attractive overall option. These textbooks create a lot of work for teachers to make them usable.if you are a non-specialist even worse. I personally only use the listenings but then again I have to change all the questions. I could go on and on. My only regret is that we invested in these. We hate the products. There must be better on the market. Truly awful. Thanks for commenting, Laure. It would not be my first choice. Looking into buying a new course. Steve Smith; which would be your first choice? Studio? Tricolore? Why?